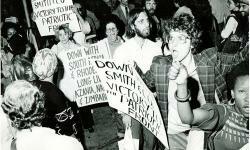 Demonstration against Rhodesian Prime Minister Ian Smith, Baltimore Hotel, New York, NY on October 13, 1978 during his visit to the U.S. Smith became Prime Minister of the British colony Southern Rhodesia on April 13, 1964. Smith was opposed to Britain's plans which would eventually lead to majority rule. On November 11, 1965 Smith issued a Unilateral Declaration on Independence and declared the "independent" state of Rhodesia in an effort to ensure white minority rule would continue "for a thousand years." But this "independence" did not win international recognition. The result was an armed liberation struggle by the ZANU and ZAPU and mandatory UN sanctions. In 1976 the Patriotic Front was formed as a political and military alliance of ZANU and ZAPU. In December 1979 Smith was forced to accept the Lancaster House Agreement. Elections were held in 1980. The liberation movement won the elections and Robert Mugabe became Prime Minster of independent Zimbabwe. Used by permission of Gregory Dunkel.